Heifer Haiti participants find creative ways to build sustainable agricultural income in a country battered by poverty and natural disaster. Diverse projects set the foundation for an $18.7 million commitment to renew economic opportunities across the country. CANCE, Haiti—Jessie Clairvil was 7 days old when she was tossed out of the third floor of a Port-au-Prince apartment building. By the time she was thrown into the hands of waiting neighbors, the third floor was more like a first floor, the two floors below having already collapsed. A refrigerator was hurtling toward Jessie's mother, Roseline Jean Pierre, when she jettisoned Jessie out of the building. Jessie's 5-year-old sister made it out next, followed by Jean Pierre, who jumped just before the rest of the building collapsed into rubble, one of many destroyed during the 7.0 magnitude earthquake that rocked Haiti on Jan. 12, 2010. The quake killed more than 316,000, according to the Haitian government. "God saved me," said Jean Pierre, sitting in a field in Cance a year and a half later. She is 26 and slim, with strong bone structure and pink toenails. In Port-au-Prince she had many friends and went out frequently. In Cance, a rural community on the outskirts of the southern Haitian city of Les Cayes, she wears a baseball hat to protect her from the sun. After the earthquake reduced much of the capital to rubble, Jean Pierre and her daughters fled south, to where her father's family is from. Having grown up in Port-au-Prince, she did not know what family she would find in the area and was surprised to meet her first cousin, Isaac Cherestal. Her mother, Rose-Ella Delsoin, later joined her in Cance, and Cherestal helped Delsoin find work sewing school uniforms. Jean Pierre is one of 600,000 Haitians who fled Port-au-Prince following the earthquake, flooding rural areas that lacked the infrastructure to support them. In addition to having to feed the newcomers, CAPAS (Coopérative d'Appui à la Production Agricole du Sud), the farming organization Cherestal belongs to, lost 5,000 pounds of pepper spice it was unable to transport to market in the chaos following the disaster. Recognizing that rural organizations such as Cherestal's needed quick help if they were to survive, Heifer initiated a program one year after the quake to supply more than two dozen organizations with animals. Jean Pierre received a gray and brown calf in July. She will use the proceeds from selling milk to buy another cow and eventually hopes to earn enough to build a house. She currently lives in the farming organization's office. It is too early to plan her youngest daughter's future, but she would like her oldest, 6-year-old Fridgie, to be a doctor. Fridgie frequently plays with Cherestal's 5-year-old daughter, Imelda, and the girls share the kind of closeness their parents, first cousins, were not able to experience growing up far from each other. The Heifer program that provided Jean Pierre's calf is just one of many initiated under a three-year plan launched after the earthquake to restore rural livelihoods and promote sustainable food and income security for 12,000 families, explained Hervil Cherubin, director of Heifer Haiti. The programs range from fish farming to draft animal training and stretch from north to south and east to west. "Heifer received many requests for help from all over the country," Cherubin said. "Since we work with local organizations, we pick organizations that have the capacity to carry on the project and fit Heifer's plan." In September, Cherubin introduced the continuation of the plan in the form of Rural Entrepreneurs for Agricultural Cooperation in Haiti (REACH), a five-year, $18.7 million commitment to rebuild rural communities and improve economic opportunities in Haiti. An integrated crop-livestock project, REACH will help more than 20,000 vulnerable rural families on a number of fronts including job creation, income generation, skills training and disaster preparedness. "This is a one-of-a-kind project that came from what the people needed (bottom up) and not what we think was good for them (top down)," Cherubin said. Both programs promise help for a country damaged by natural disasters, corrupt regimes and improper aid long before the earthquake struck. Countless organizations came to Haiti's aid post-earthquake, but Heifer is one of the few that focuses on what history has proven to be the basis of progress, increasing agricultural productivity and thereby building the foundation of a more advanced economy. The road to Ivoire in West Haiti is treacherous. From the nearest city of Montrouis it takes an hour of bone-shaking travel battling stone outcroppings, steep cliffs and dangerous switchbacks in a Land Cruiser to reach the community. It is a journey that keeps many away but drew Heifer, said Ewaldy Estil, head of Heifer's northern office. "When we started as Heifer in Haiti we were trying to work with people very marginalized, people very poor," said Estil, who joined Heifer in 2000. Clinging to the Chaine des Matheux mountain range nearly 3,000 feet up, the people here eke out a meager existence farming the rocky and steep terrain in eight small settlements. Their isolation is what attracted their ancestors who came to the region as escaped slaves. When they tried to return to the lowland following independence, they found there was no place for them in the new society, Estil said. So they returned to the mountains and cleared the land for farming, not realizing that without trees to slow its flow, the rain would erode their soil and flood the valleys below. "The people living in the town don't have a plan for the people living in the hill," Estil said. "The people living in the hill, they are not going to have a plan for those people living in town." Heifer's plan in 2002 was to partner with another group, OPD-8 (Peasant Organization for the Development of the 8th Section of Arcahaie), already engaged in teaching sustainable agriculture. Together they taught one settlement of 250 families how to build stone ledges to prevent the hilly terrain from further erosion and to protect the land below from floods. They also encouraged the families to plant trees and discouraged them from burning to clear land. Ernilia Laurent now feels "a gentle wind" blowing through the trees and sees more green in the landscape. In her garden a cup of seeds produces six or seven cups of beans instead of the two it used to yield, the difference between subsistence and savings, Heifer's main goal. Laurent also mentioned that after attending workshops on gender and violence, the men who once beat their wives no longer do so. She also said the training has helped women in the village feel more comfortable visiting the nearest market, a two-hour trek down the mountain. "In the past they (people in the lowlands) used to call us ‘people from the mountain' as a way to reject us," Laurent said. "Now they don't see the difference." Laurent hopes the improved agricultural yields will help her to afford an apartment in the lowland town. Then her three children can stay there during the week when the time comes for them to attend secondary school. Her oldest is only 6, her youngest just 7 months. At 28 she has already learned not to hope for too much. She has not seen her husband since he went to work in the Dominican Republic over a year ago and won't hazard a guess as to when he might return. While she had long dreamed of a new home, she never believed she would actually have one. But after the 2010 earthquake destroyed many of the earthen structures in the area, Heifer returned to fund the building of 100 new homes, 28 of which are complete. Laurent moved into her new home in July and turned her former home, a low thatch-roof structure lacking walls, into a kitchen. "That is a miracle from God," she said. "God gave that miracle to our family and it changed our life." She has gone from living in a structure no better than what would house an animal to a concrete block home with white embroidered curtains and space for a table. She has already chosen the table. Chairs will have to wait until there is more money. Nearby, Ozana Charles sat in a chair between two houses, an old and a new. The old earthen structures have gaps and holes and lean to the side. The new ones are strong and straight and smooth-walled. But Charles can't see this. She has been blind for 13 years. She doesn't know how many years she has been alive, just that she was born during the term of President Elie Lescot in the 1940s. She said she senses a difference in the community. "I have the feeling that the country is more beautiful because of the way people are talking about the environment now," she said. Heifer's Cherubin sees the beauty as well, and not just in Ivoire. He sees it in the rare white sand beaches that haven't been blanketed with litter, in the restaurants that offer seafood fresh from the ocean and in the efforts of health-conscious Haitians jogging on the beach. It isn't that he doesn't see the heaps of refuse clogging the waterways or the motorcycles creating havoc on the roads, he just sees something else as well. As a youth growing up in Haiti he was aware of the suffering around him and was not shy about advocating for change and bringing up issues not everyone wanted to hear. In a marginalized neighborhood near Les Cayes, the fishermen do the talking. Nelson Joseph sits in the shade of a tree repairing a net. He is 32 and a father of three. He isn't sure how he learned to mend a net—it's just something he picked up growing up in La Savane, an impoverished fishing village on the outskirts of this southern city. "When you have a car you learn to drive," he offered without glancing up from his work. Here you learn to fish because "the sea is the only source of income for poor people," he said. Fellow fisherman Jean Claude Saintvil added that fishing is an occupation that does not require an education. Saintvil learned the craft as a boy, bailing water from his godfather's boat. At one time the fishermen of La Savane could support their families fishing in the nearby bay. But overfishing and pollution have made it necessary to go further out, a difficult task in the beat-up crafts the men power by oar and wind. Emisio Joseph realized the lack of equipment was hindering the main occupation in his community and asked Heifer to fund his organization (Organization des Jeunes de la Savane des Cayes-OJSC) aimed at improving the situation. The boats Heifer #1 and Heifer #2 breasted the waves setting out into the ocean powered by 15-horsepower Yamaha engines. On the water they sped past their counterparts, battered vessels with tattered sails. "Before they went to fish and they were bringing back only two pounds, now they can bring 20 pounds," Emisio Joseph said. The increased yields allow them to plan for the future instead of just focusing on food for one day, a gift Heifer provides worldwide. The fishermen will pass on this gift to their colleagues by putting 40 percent of their profits toward the building of another boat. The goal is to eventually have eight to ten boats, each shared by four families. The dwellings in La Savane lack electricity, so Heifer purchased a generator to power a freezer to store the fish. The fishermen keep the generator in a church across the street from their group office, counting on thieves to be God fearing. Saintvil is 60. Before he was given a spot on Heifer #2 he struggled to row his boat. When asked how Heifer #2 will change his life he offers an impish smile. "Seeing me in two years I will be younger because I will make money," he said. It is not just a mountain that cuts off the community of Ti Trou in the lower Central Plateau region of Haiti. There is also Lake Peligre, home to the Peligre hydroelectric dam. To reach most everything—from schools to health care facilities—one must cross the lake. A boat ride takes an hour and costs 200 gourdes ($4.90). The expense prevented Elie Jean, 41, and his wife, Leanne Gabriel, also 41, from continuing past the first few years of school. When it comes to their four children, they struggle to pay 6,000 gourdes ($146.88) a year to rent a place across the river where the children can stay during the school week, which doesn't always leave enough for school fees. "Sometimes they used to return them back home because we couldn't pay," Gabriel said. Like most of the men in the area, Jean is a fisherman. At least he was until the government drained the lake to repair the generator in 2006 and failed to restock it. Jean attempted to support his family by harvesting beans and plantains. But after the earthquake, their meager supplies were stretched even thinner when family from Port-au-Prince moved in. The five family members have since left. The ulcers their 19-year-old son Kenel developed from not eating enough during that time remain. 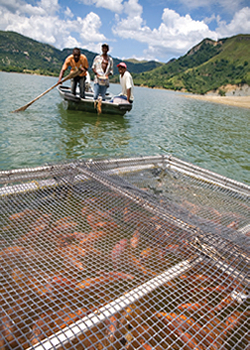 In spring 2011, Heifer partnered with several organizations to supply Jean and 10 other fishermen in the community with 2,400 fingerlings and floating cages. Buyers for the fish have already been established, and if all goes as planned, Jean and his counterparts expect to receive 50,000 gourdes ($1,223) each for their first harvest four months after they received the fingerlings. They will keep 30,000 gourdes ($733) and put 20,000 gourdes ($490) toward the purchase of another cage and fingerlings for another family until 26 families have cages and fish. Jean will put his money toward his children's education. "Our dream is to see one of our kids be like a doctor or agronomist," he said. "Even a priest," added his wife. "We don't want them to stay here to fish … we want them to go farther," Jean said. Kenel wants to be an agronomist and knows it is the fish that will get him there. One night he slept on the beach guarding the cages from thieves with his father, something the fishermen do nightly. "It's not fun," Kenel said. But the change in the two-room house since the fingerlings arrived has been enjoyable. "The atmosphere I see is happier than before because we can feel the hope of having a fixed source of income," he said. A regular income means the family can set aside money for education so the next generation will have more options than the present one. And that is what pulled Cherubin back to Haiti—hope for the future and the youth of Haiti. "They have suffered so much that many of them seem like they have given up on life," said Cherubin. "I wanted to return to help with the process of rebuilding the country and (restore) hope for young Haitians." His favorite thing about working with Heifer is being able to help people help themselves. "We don't do things for them," he explained. "We work alongside them to help them solve their problems." Support Heifer Haiti's integrated crop-livestock program, REACH, today!